South Korea’s unification and transport ministers, as well as South Korean families separated by the Korean War will attend the groundbreaking ceremony for a project to modernize and connect inter-Korean roads and railways, the Unification Ministry said Monday. About 100 South Korean participants, including Unification Minister Cho Myoung-gyon, Land Minister Kim Hyun-mee and chief of the ruling Democratic Party Lee Hae-chan, will attend the event scheduled to take place 10 a.m. Wednesday at Panmun Station in the border city of Kaesong, according to the ministry. 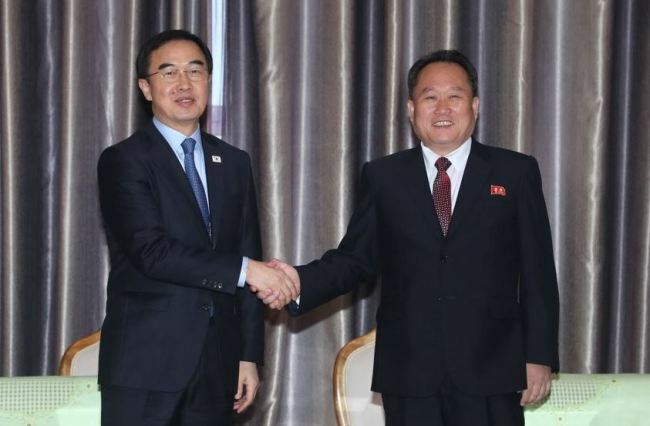 Six North Korean officials, including Ri Son-gwon, chairman of North Korea’s stage agency in charge of inter-Korean ties, and Railway Minister Kim Yun-hyok, will also participate in the hourlong ceremony, according to the ministry. Among the attendees are five South Korean civilians whose families have been separated by the 1950-53 Korean War and the last locomotive engineer who drove the inter-Korean train until December 2008, the ministry said. A nine-car train carrying South Korean participants will leave Seoul Station at around 6:45 a.m. Wednesday. Armida Alisjahbana, executive secretary of the UN Economic and Social Commission for Asia and the Pacific, will also join the event, along with top railway and road officials from Russia, China and Mongolia. “I think the groundbreaking ceremony is meaningful in that it shows the Koreas’ willingness to proactively cooperate on connecting and modernizing railways and roads,” Baik Tae-hyun, a ministry spokesman, told reporters during a regular press briefing. The project -- agreed to by leaders of the two Koreas at their April 27 summit -- has been delayed amid concerns that it could undermine international sanctions against North Korea. The Koreas completed an 18-day inspection of the North’s railways only after the US agreed to a sanctions exemption for the joint survey. Seoul has maintained that the ceremony in itself does not violate sanctions because it does not mean the Koreas will begin construction right away. The government will push for the project in line with sanctions and progress on the North’s denuclearization, Baik said. The government, however, has requested sanctions exemptions for the train and other equipment needed for the groundbreaking ceremony, according to the ministry. The US agreed to sanctions exemptions for the ceremony through the allies’ second working-group meeting held in Seoul last week. A 31-member advance team comprising South Korean government officials left for North Korea on Monday to prepare for Wednesday’s ceremony. A 14-member advance team was sent to the North for a one-day trip a day earlier.